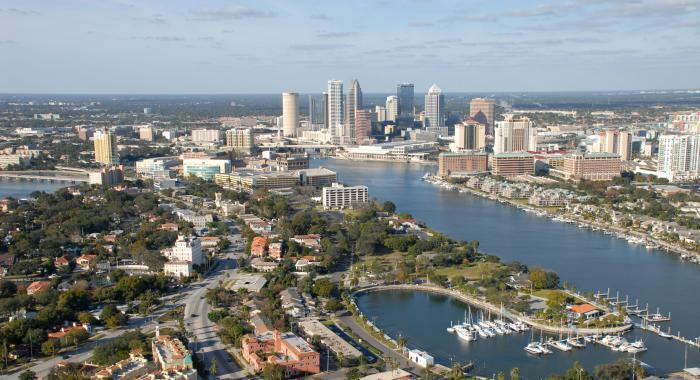 Jacksonville is the highest populous city in Florida, and the 12th most populous city in the United States. The estimated population of Jacksonville is 907,529 as of 2017, according to the US Census Bureau. The median age of Jacksonville residents is 35.7, with the median household income being $48,256. This is slightly lower than the median household income of the entire Florida state, which is $48,900. Poverty level of Jacksonville is at 17% in comparison to the poverty level of Florida at 14.7%. The drug crisis in Jacksonville has attracted the attention of many media platforms and made headline after headline in the state. The North Florida High Intensity Drug Trafficking Area (HIDTA) reports that the drug markets in Jacksonville are increasing due to its proximity to Atlanta, Georgia, which is considered the primary source for cocaine, methamphetamine, and marijuana distribution. News 4 Jax claims that the opioid problem in Jacksonville has gotten so bad, morgues are turning away bodies. Chief medical examiner Dr. Valarie Rao comments that drug overdoses have occurred every single day for 8 months, and the morgue is running out of space to store the corpses because opioids are killing so many people. After careful review through reports over the span of a year, News 4 Jax has deemed kids in the Jacksonville area most prone to substance abuse than other parts of Florida. A survey from the Department of Children and Families reported 30% of Florida’s children admitting to using substance abuse in their lifetimes. Assistant special agent in charge of Jacksonville’s District Office of the Drug Enforcement Administration, Chad Cook observed that behind marijuana and alcohol, prescription drugs are the most abused substance among children. The number of drug-related deaths in Jacksonville have increased by 200 from 2015 to 2016. Dr. Rao observes that fentanyl and heroin seem to be the main source of overdose deaths. The Florida Times confirms this statement, reporting 49 fentanyl related deaths within the first four months of 2016. The Jacksonville Fire and Rescue department have reported a 93% increase of Narcan use since January 2016, administered by the fire and rescue staff a staggering 708 times. First Coast News reports that heroin kills more people than guns in Jacksonville, with the availability of heroin increasing its popularity. Heroin is now cheaper and more potent because dealers are lacing it with fentanyl. Opioids are a class of narcotics that include heroin, fentanyl, and pain relief medication. Opioids are generally deemed safe to use when prescribed by a healthcare professional and when used for a short period. However, many users continue to abuse the drug due to the euphoria it produces with pain relief. Regular use of opioids ends in addiction and dependence, as well as tolerance. With misuse, consequences can be dangerous and even life-threatening. Many individuals that have been prescribed opioid-based medication will become addicted. Then, when they begin to build a tolerance to the medication, they will require more. Prescriptions can be hard to come by and expensive, so many of users will turn to the cheaper and more readily available option – heroin. In the 2016 annual drug report released by the Medical Examiners Commission of Florida, total drug-related deaths increased by 22% from 2015 to 2016 (more than 2,126). Opioid-related deaths alone saw a 35% increase, totalling 5,725. Additionally, prescription opioids were found more often than any other substance, including fentanyl. Fentanyl deaths increased by a staggering 97% within a year. First Coast News reported a $1.5 million program aimed at fighting Jacksonville’s opioid crisis to have been set into motion in 2017. The program will test treatment strategies for patients who have been hospitalized for opioid overdose to determine the most effective method for combatting addiction. In addition to fentanyl, more deadly derivatives have begun to hit the streets of Jacksonville. The acetylfentanyl is more potent than fentanyl, and does not respond as effectively to Narcan, so the opioid crisis could be getting worse. In weaker doses, methamphetamine is used for ADHD and obesity treatment, however, it’s more commonly used recreationally. Continuous usage of methamphetamine in high doses can result in dependence, psychosis, fatigue, weight loss, paranoia, and rapid mood swings. Additionally, stopping use of methamphetamine after periods of regular use can result in withdrawal. Symptoms can be fatal for some. Methamphetamine continues to be the latest threat to those residing in Florida. According to the North Florida High Intensity Drug Trafficking Area Drug Market Analysis, Mexican drug trafficking organizations have increased their influence over the distribution of a variety of illicit drugs, especially methamphetamine. Distribution and abuse saw an increase in the North Florida region as local production of methamphetamine continues to be an issue in the region. The level of violence and increasing number of deaths are the major contributing factors to the magnitude of threat to residents. According to the NFHIDT, the number of methamphetamine laboratories in the area have decreased as laboratory operators are now distributing Mexican methamphetamine, from which they can attain more profits. A report by News 4 Jax states that China is also one of the main sources of methamphetamine, producing copious amounts and sending it into the United States. Amongst school-children, methamphetamine can be linked to several problems, including poor performance, teenage pregnancy, sexually transmitted diseases, theft, and behavioral problems. Different treatment courses are readily available for addicts that wish to recover from substance abuse. Rehabilitation includes assessment, intake, rehabilitation, outpatient treatment, aftercare, and sober living. If you or your loved one is suffering from addiction, don’t be afraid to ask for professional help. Medical professionals including doctors, nurses, psychiatrists, counsellors, and therapists are readily available throughout Jacksonville, and only one phone call or visit away. The Substance Abuse and Mental Health Services Administration website lists 42 drug rehabilitation and detox programs throughout Jacksonville. According to Drug Rehab Services, Florida was the prime location for individuals using and selling opiates. This caused substance abuse treatment and detox programs throughout the area to become more diverse and effective. The many treatment centres across Jacksonville cater to individuals of different circumstances and needs, including pregnancy, religious, social status, age, military, and ethnicity. When choosing the right treatment centre and treatment method, it’s important to take into consideration the different factors affecting the addict. This includes the individual’s financial status. The level of treatment available varies for free and paying patients, as well as the type of drug they are being treated for, length of addiction, and mental and physical health conditions. It is recommended for addicts attempting recovery from substance abuse to be assessed by a medical professional before choosing a treatment program. Prior to admission into a treatment program/facility, the individual will need to show symptoms of addiction or be positively treated for a drug test. Medical professionals such as doctors, nurses, counsellors, psychologists, or other addiction specialists may conduct an assessment to determine the best course of action for a specific individual. Based on the circumstances and goals of the assessment, the questions asked during the assessment may vary. In addition to substance abuse, the person conducting the assessment may ask test for related problems. For example, sexually transmitted diseases are often associated with substance abuse, so a health screening may be required in specific patients to ensure proper treatment of diseases and to stop them from potentially spreading to others. The content assessed during the assessment will generally cover the type of substance being treated, drug abuse history, criminal history, physical health, psychological health, and special considerations such as literacy level, language barriers, housing, and family history. Because there are no legal guidelines for assessment, the guidelines will vary from setting to setting. Accuracy of information collected for assessment is dependent on the individual’s honesty. Some addicts will feel the need to conceal or lie about their addiction out of shame or guilt, but this will greatly affect the effectiveness of their treatment and can set them back from the very beginning. It’s normal for a variety of different healthcare professionals to conduct assessments. This is so they can confidently provide the patient with the correct diagnosis and treatment plan. Moreover, the information obtained through the assessment will be kept confidential and is only used by the centre/facility to determine a diagnosis and effectively plan a course of treatment best suited for the individual. If results of the assessment indicate that the individual requires further level of treatment, the next step will usually be detoxification. Some detoxification centres can offer the option to treat the patient at their home or in the community. This type of treatment is typically for individuals with a physical dependence on alcohol or other addictive substance. Physical dependence can be defined as a need to increase the amount of substance they take to feel and effect, otherwise suffer from physical and mental withdrawal symptoms if they stop taking it. Some detoxification facilities require a referral from a medical practitioner, others have a walk-in or appointment policy. If the patient hasn’t already been assessed before visiting the detoxification centre, they may be required to do so. This is to determine whether they need detoxification and the best course to take depending on their individual circumstances. Some individuals attempt sobriety by going through the detoxification process by themselves in their own homes. This is accurately portrayed in movies such as Trainspotting, where one of the main characters locks himself in his room until his withdrawal symptoms are gone. This is a dangerous, potentially life-threatening course of action and is not recommended. Instead, the individual should attempt detoxification under the close supervision of medical professionals who can provide urgent medical attention when required. Several determining factors account for the length of detox required for a specific individual. The length of detox is decided using information gathered during the assessment. One important factor is the type of drug being treated for, as some substances leave the body faster than others. Heroin can take a week or more to fully leave the system. After successfully completing a detoxification treatment, the patient may choose to take the next step towards sobriety; checking into a rehabilitation clinic. Some patients will either choose to only go through the detoxification process or skip the rehabilitation centre to go straight to a partial hospitalization program, outpatient program, or aftercare. However, a full-time stay at a 24-hour rehabilitation clinic is recommended after detoxification to prevent potential triggers and relapse. The rehabilitation process aids recovering addicts in preparing for or obtaining suitable employment. Most inpatient rehabilitation clinics will require the patient to stay for a minimum of 28 days, but this depends on the individual. Some may be required to stay for a shorter period, and some may require extensive treatment and stay for 3 to 6 months. The main reason most people will choose not to attend a rehabilitation clinic is the cost. However, Jacksonville provides an extensive number of free, government funded clinics. Some in-patient clinics also accept Medicaid and other funding options. The structured environment of a live-in rehabilitation clinic is beneficial for recovering addicts who need a change in environment or can otherwise not handle triggers to avoid relapse. If it is difficult for the individual to remain sober in their existing living environment, they should check into an inpatient treatment centre. Medical aid and professional care are available 24 hours a day on-site and the patient will be provided with regular psychotherapy and behavioral therapy. Therapy is considered the “meat” of any process of sobriety. Certified professionals will address existing or potential obstacles that could be the cause of the patient’s substance abuse, or otherwise be obstacles to their sobriety. Patients will be given professional advice on how to handle their issues and be encouraged to adapt new mindsets and behavioral patterns to counter the issues. Some patients may be prescribed medication to control their cravings. This can be either short-term or long-term depending on the drug being treated for and the individual. Partial hospitalization provides the individual with the freedom to go about their day-to-day activities with minimal disruption to their routine. Again, there are free, or Medicare covered programs to choose from. PHP programs that are not free or covered by Medicare can be quite costly, but still less expensive than some inpatient treatment centres. PHPs provide the most intensive level of outpatient care that is available within the many choices of treatment programs. Recovering addicts who may benefit most from a PHP are those who suffer from behavioral problems or mental illness as well as addiction. Most PHPs will require that the individual has already completed inpatient treatment or those who do not require to first go through the inpatient treatment process. Types of therapy provided by a PHP vary between settings, but often include cognitive behavioral therapy, dialectal behavioral therapy, and acceptance and commitment therapy. As with all other treatment processes involved in substance abuse recovery, the PHP program is designed to cater to the individual needs of each patient. Typically, the patient will be required to attend individual therapy sessions as well as group therapy and family therapy. Progress is carefully monitored by addiction specialists and the length of treatment may be extended or shortened depending on the progress the individual has made throughout the PHP. Upon completing a PHP, the recovering addict may choose or be required to attend either an outpatient treatment program or aftercare treatment such as Alcoholics Anonymous or Narcotics Anonymous meetings. This depends on the individual and their confidence to remain sober after their PHP. An additional option is for the patient to move into a sober-living home. The different treatment options are explained below. Outpatient treatment is recommended for recovering addicts who have completed inpatient treatment, a partial hospitalization program, or are confident in their ability to manage their addiction without intensive care and supervision. Inpatient treatment and involvement in a partial hospitalization program are not prerequisites for most outpatient programs but the individual must be confident that they do not need extensive medically supervised care. Outpatient treatment allows recovering addicts to continue their recovery therapies on a part-time basis without interrupting their daily routines. Group therapy is the primary focus of outpatient treatment centres, with focus also on the patient’s family members’ involvement. Individual therapy is also provided mainly to record the patient’s process and occurs on a weekly basis during the treatment period. As the patient progresses throughout their treatment, they will be required to attend less therapy sessions, less often. When the individual and their medical practitioner feels it is suitable, they may choose to end their outpatient treatment program and continue through to aftercare. Aftercare is a crucial element to effective recovery and maintaining sobriety. Often, the progress made during treatment is put to the test and the recovering addict will be required to recognize and avoid triggers, cravings, and relapse. A 12-step program is the recommended aftercare treatment option. The 12-step program may have been discussed during inpatient treatment, partial hospitalization program, or outpatient treatment. These programs include Alcoholics Anonymous and Narcotics Anonymous and are designed to provide continuous support to recovering addicts. They will often be incorporated into rehabilitation programs, but individuals are not required to come from one in order to attend. Many 12-step programs can be found across Jacksonville and can be found in treatment centres also providing inpatient, partial hospitalization, and outpatient treatment. More than 23 state/government funded or luxury sober-living houses can be found across Jacksonville. Sober-living houses are also often referred to as halfway homes, sober environments, or group homes for addicts. These houses are usually located in a quiet neighbourhood area to provide recovering addicts with a safe and peaceful environment to live in. Often, individuals who have completed treatment programs will check themselves into a sober-living home to further assist them in their journey to recovery. Studies have shown that sober-living homes are most effective when paired with a treatment program, but prior treatment isn’t a prerequisite to be admitted into a sober-living home. Rules, curfews, and meetings are mandatory for residents. They are also required to undergo random regular drug tests to prove their sobriety. A sober-living home is most beneficial to recovering addicts that can reasonably manage their sobriety and can take responsibility for themselves. They may be required to pay their own rent (in homes that aren’t free), groceries, and other amenities which they would do if they were living elsewhere. Violations of rules and regulations can result in the individual being asked to leave.